Q: I know that those funny little series of black squares I see on adverts and products have something to do with computers, but what are they and how do they work? A: I think you’re referring to QR codes (which stands for Quick Response). They’re designed to make it easier for you to visit a website when you can’t click on a link, like when reading printed publications or, as you said, looking at the back of a product. All these little black squares are positioned in a specific way so when you point a QR-reader to it, it will read it and offer you to visit a website it’s linked to. It was a little fiddly though, because you had to download a specific app in order to take advantage of this feature, and as we all know, humans would rather not have to work so hard. 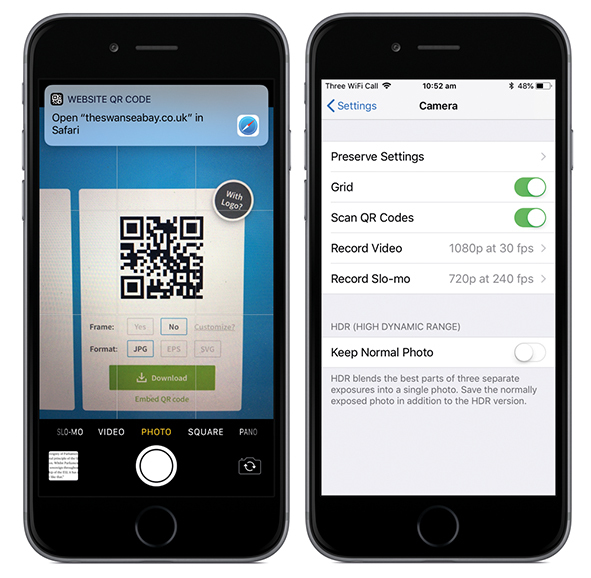 Thankfully, Apple finally implemented QR reading ability into iOS 11, which means all iPhones and iPads updated to the latest version will be able to take advantage of these codes right from the Camera app. Just point your camera and once the code is read, a menu will drop down offering you to visit the site in Safari. It even shows you the address before you tap on it so there are no surprises. This feature should be on by default, but if it isn’t, go to Settings> Camera, and make sure Scan QR Codes is turned on (if that option isn’t there, you’re running an older, incompatible version of the system).